This advertising feature is brought to you by Johnnie Walker. Find out more. While toasting the new year with a tipple or two is a time-honoured tradition the world over, nowhere else observes the passing of the old year quite like Scotland. As Christmas Day didn't become a public holiday in the country until 1958, some Scots place a greater emphasis on Hogmanay during the festive season, and with particular gusto. So whether it's partying into the wee hours at Edinburgh's famous street party, or by braving the Loony Dook and plunging into the frigid waters of the Forth first thing in the morning, Hogmanay traditions play an important part in starting the new year in good stead. And of course, it wouldn't truly be a Scottish ritual without a wee dram, would it? One prime example of this is the practice of first-footing, wherein a family arranges for a tall, dark-haired man to be the first person to cross over their threshold soon after the clocks strike midnight. This first-footer is usually bearing small tokens that signify the various well-wishes for the new year, such as a piece of coal to keep the hearths warm, bread and salt to satisfy hunger – and, of course, a small measure of whisky, to represent that all-important good cheer. Once the bells have rung in the new year, the first footer is invited inside to rejoin the festivities, and guests regardless of gender and hair colour can party the night away. Staying true to this spirit of starting the new year off on the right foot, Johnnie Walker have set up camp on Edinburgh's historic Mound in their two-story Bothy Bar over the holiday season. With an extensive menu of whisky cocktails and hot toddies on offer, the Johnnie Walker Bothy Bar continues the tradition of serving up revelry and cheer, whilst also showcasing the incredible whiskies from every corner of Scotland that go into creating their signature blend. Each of the cocktails on offer at the Bothy Bar feature a festive twist, such as the 'Some Like it Hot' toddy, which adds a splash of the characteristically smooth Johnnie Walker Black Label whisky to a mulled apple juice, deliciously spiced with cinnamon, star anise, cloves and bay leaves. Or there's the wonderfully zingy the 'Hot Headed & Red Blooded', which combines Johnnie Walker Black Label with a sharp blood orange puree, cranberry juice and warming ginger syrup – perfect for warming chilled hands and limbs. So wherever you are in the world, let's raise a glass together to 2019. 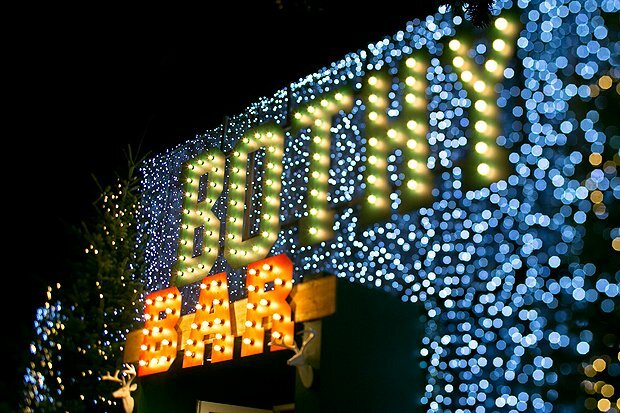 You can find the Johnnie Walker Bothy Bar on the Mound until 5 Jan, as part of Edinburgh's Christmas.